Web extra: Find an interactive map showing what Spokane County water customers use and pay at http://data.spokesman.com/water-services/. 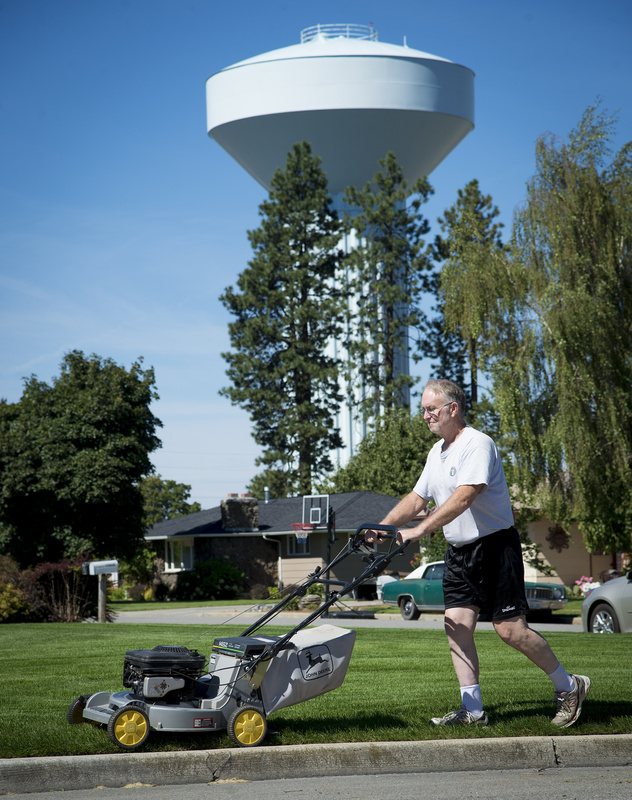 On a corner lot in the center of Spokane Valley, Rupert Butler tends to his large lawn below one of Modern Electric Water Co.’s conspicuous water towers. His grass is green and healthy, and Butler takes care to find the right mix of water and fertilizer to keep it that way all summer long. He sees plenty of wasteful watering, though, around his neighborhood: sprinklers left on for hours or running in the heat of the day, water splashing onto sidewalks and streets. For someone who has lived and worked in parched areas of Texas and California, he shakes his head at it all. “What kind of irritates me is somebody turning on a lawn sprinkler and just letting it run while they go to work all day,” said Butler, who is retired from the USDA Farm Service Agency. But what’s to stop them? Water here is abundant and cheap, drawn from a massive aquifer under the valley floor and piped with little or no treatment to half a million people. Water rates in Spokane County are lower than in any other county in Washington, and just a fourth of what people pay in the Seattle area. All of a household’s daily consumption – for cooking, bathing, washing clothes and dishes, even watering a lawn and garden – costs less here than the retail price of a single bottle of water. With enough water to fill Lake Coeur d’Alene 13 times over, the Spokane Valley-Rathdrum Prairie Aquifer nurses a greenbelt extending from southern Bonner County down through Coeur d’Alene and Post Falls and west into Spokane Valley and Spokane. “It can be said that there is no city in the world that has a better water supply than Spokane,” a city official boasted in 1909, and the claim rings true today. “It is without question one of the best sources of drinking water in the country,” said Dan Kegley, the current director of the city of Spokane Water Department. Cheap water and cheap land transformed the Spokane Valley into a landscape of orchards and vegetable farms a century ago, and even today the wealth of readily available, clean water ensures that no one pays very much for all they need. What he didn’t expect was the bewildering array of water purveyors operating in the Valley. Butler is in Modern’s service area, but his daughter’s house directly across the street is served by Vera Water & Power. And just a few streets south of them, homes fall inside Spokane County Water District 3. Spokane Valley is a jigsaw puzzle of water systems – 13 in all – that evolved from supplying agriculture to serving homes and businesses as farmland was developed. Those purveyors and another eight in and around Spokane collectively operate 122 wells to supply drinking water to half a million people. Each purveyor operates independently under an assortment of legal authorities with starkly different rate structures that even they find almost impossible to put side by side. A 2013 survey by Raftelis Financial Consultants Inc. showed Spokane County has the lowest average water rates in the state, with a combined base rate and water use charge of about $17 a month. But the survey included just three systems in the county: the city of Spokane ($23.74 a month on average), Modern ($15.80) and Vera ($14). That left out tens of thousands of residents who get their water from other purveyors in the area. In addition to municipal systems like Spokane’s and cooperatives like Modern, there are special purpose districts – commonly known as water or irrigation districts – as well as private water companies. “Each little fiefdom does it differently,” said Ty Wick, general manager of Water District 3 and president of the Spokane Aquifer Joint Board, made up of the 21 water purveyors in the Spokane area. Some operators, Wick said, have little overhead and defer maintenance to keep their rates low. Irrigation districts, which typically charge a low flat rate for a year’s worth of water use, “have an advantage because they have taxing authority, so the county does most of their billing and keeps track of the assessments,” he said. Smaller, struggling systems also have qualified for state or federal grants and low-interest loans, deepening the disparity in water rates between service areas. “That’s been a complaint that I’ve had is these small systems don’t have to charge what they should be charging because they get access to this easy money, and the ones that are responsible, they don’t get it,” Wick said. Susan McGeorge, manager of Whitworth Water District 2 since 1988, said at first she thought every purveyor operated like Whitworth. “I learned fairly quickly that it wasn’t just one or two differences, there were a whole host of differences,” she said. As for what they charge, rate structures are as diverse as the purveyors themselves. “One board may decide they want to keep the water as low as they can, but will make that up by charging a higher connection fee,” McGeorge said. “They might charge a meter fee along with the water, or a difference between residential and commercial. “The main thing is they have to cover their costs,” she said. Running pumps is one of the bigger operating expenses, so electricity costs are a key influence on water rates. Fortunately for customers of Spokane’s water system, the city owns and operates a hydroelectric facility on the river. Another expense that affects rates is water treatment. Most systems in Spokane County add chlorine to the water, but a few purveyors have held out. Whitworth, which serves more than 26,000 people north of Spokane, is the largest nonchlorinated system in the county, and that certainly keeps costs down, McGeorge said. “We draw it from the ground and it goes straight to the reservoirs and into our homes,” she said. Even local systems that do chlorinate don’t spend nearly as much as systems like those in Western Washington that must filter and treat water taken from rivers and lakes. Also in contrast to the West Side, water conservation has been slow to catch on in the Inland Northwest. Spokane County households are some of the thirstiest in the state. Residents here on average use more than 200 gallons a day – nearly twice the state average, according to the U.S. Geologic Survey. “Unfortunately, we don’t have a conservation mindset, partly because we’ve been told for so very many years that there’s a lot of water in the aquifer, we don’t have to worry about shortage,” said Rachael Paschal Osborn, a Spokane environmental attorney and senior policy adviser for the Center for Environmental Law and Policy. Only recently have people here begun to understand how interlaced the aquifer and Spokane River are, and how pumping from the aquifer contributes to low summer flows that imperil fish in the river, Osborn said. Water shortages have led to rationing and driven rates higher in communities across the West, and not just in arid regions. In and around Seattle, property owners are in the habit of letting their lawns turn brown in the summer. But neighborhoods in Spokane, across the Valley and into North Idaho are largely green and lush straight through the heat of July and August. In those two months, demand on the aquifer soars as outdoor watering peaks around homes, parks, office complexes, churches and golf courses. Wells pump about 3,000 gallons per second, or more than 10 million gallons an hour, to keep up. Watering on the wrong day or at the wrong time will invite a warning or citation in many places outside the Inland Northwest. Above the local aquifer, however, nothing much stands in the way of excessive or careless watering practices. Some purveyors believe the pocketbook is one way to change those bad habits. “To me it makes sense: If you’re using more water, you need to pay more,” said McGeorge at Whitworth Water, which switched to conservation pricing 15 years ago, well ahead of the curve. The heaviest users backed off, and the district has kept its average residential use below the peak of 1998, she said. Whitworth today charges $20 a month for 7,480 gallons of water for domestic use. After that, customers pay increasingly higher rates the more they use. Many believe Spokane’s move to an aggressive tiered-rate structure in 2010 doomed Mayor Mary Verner’s re-election bid in 2012, and customer complaints about the higher rates prompted city leaders to pull back to a more modest, conservation-based approach. Not all purveyors in the region have bought into the strategy, and a few still offer discounts for their heaviest consumers. An ascending rate structure may not be all that effective in reducing overall water use, said St. Clair at Modern, which has a basic monthly charge and a simple rate of 40 cents per 748 gallons. The state requires water systems to craft conservation plans and provide annual water efficiency reports, and purveyors are making good progress in reducing how much water they lose in their pipes, St. Clair said. Modern has brought its water loss down to 8.7 percent, below the state threshold of 10 percent. “We had a leak survey done by a contractor, and we went out and fixed every hole they found and a couple they didn’t,” he said. In April, the Spokane City Council passed a resolution supporting new water-efficiency goals. It calls for reducing indoor residential use by 0.5 percent a year and outdoor use by 2 percent a year for all customer classes. That continues a downward trend since 2000, a year Spokane pumped 26 billion gallons from the aquifer, Kegley said. Now, the city is down to about 20 billion to 22 billion gallons a year. Despite campaigns touting water-saving tips and offers to help people lower their water bills, many customers remain indifferent about conservation, Wick said. Several utilities offer their customers free rain gauges and soil moisture sensors to reduce unnecessary watering, but few people take advantage of it, he said. “There just doesn’t seem to be the mindset or the incentive at all to save water,” Wick said.